You can improve your confidence and competition results by learning how to focus your mind and develop greater awareness. Your horse will be happy and safe too! Hannah and Branie. Branie is only 138cm tall! Ive just had a lovely half term holiday taking my daughter Hannah to competitions. She had a breakthrough with her level of focus in the arena, and finished with two 1st’s, two 3rds, and four really smart double clears! It was very interesting how her pony Branie immediately became more ride-able when Hannah’s awareness and focus increased! He was happy to cooperate with her enthusiasm! This is because horses are permanently tuned into our state of mind, and will reflect back to us our true thoughts and feelings. Horses mirror our state of mind, so whatever your predominant emotion is when you are riding, is likely to be the predominant emotion of your horse. I had asked Hannah to grade her awareness/focus from 1 to 10. One means you are unable to focus and completely unaware of what is happening, perhaps through fear or anxiety, or just lack of concentration or tiredness. Your breathing will also be shallow, and it feels as if there isn’t enough time to think. Ten means you are in a state of complete flow, you are aware of all the tiny details, and are able to adjust yourself immediately to any challenge. In this state you will be breathing deeply, and have a soft focus that takes in lots of information as opposed to zooming in on one thing. Ten doesn’t mean everything is going to go well and you will have a fantastic ride, what it does mean is that you are in a state that allows you to calmly deal with any challenge. Being highly aware also means that after the event, you will have recorded everything that happened in your memory. If you did well, you can replay the event for increased visualization of success, and if something went wrong, you will be able to objectively pinpoint where the problem was, and take steps to improve. So, if you are approaching a fence and you realise your striding is wrong, you have space and time to adjust yourself and/or the horse, rather than panic and “black out”. The same applies to a series of dressage movements. If you strike off on the wrong canter lead, or go the wrong way, does the rest of the test go downhill in a muddle of kick and pull, or can you immediately rescue the situation? The competitor with the winning edge is usually the one with the clearest mental focus. And its not just for competitions. When you are out hacking, if you see a vehicle approaching with a rattling trailer behind it, are you able to calmly plan a course of action to park your horse out of the way as the vehicle passes, or does the moment become a blur as you pray nothing horrible will happen? The safest rider is the one who is able to think clearly when things don’t go as planned. You might think “blacking out” is rather a dramatic description, but many people do just that! When I do this exercise with people and ask them to put a number on their awareness , for many of them it is a revelation to discover that it is below five, sometimes even a two or three. On a basic level, clearly it isn’t safe to be riding a horse on such low awareness, and this I feel is the cause of many unnecessary accidents, so from that perspective, clear focus is a very important riding skill and shouldn’t be overlooked. Get into the habit of asking yourself, “on a scale of one to ten, how aware am I ?” Use the information you get to start improving your focus. Notice what factors reduce your awareness and what factors help to increase it. So how do you develop a high awareness? Breathing is the first port of call. Are you able to maintain a steady, deep and rhythmic breath, or do you find yourself holding your breath. Breathing can be practised off-horse at yoga, pilates or meditation classes, or buy a CD that you can listen too. Stay in your comfort and stretch zone, and don’t conspire to allow events to put you in your panic zone. This means being honest with yourself about your own ability levels. Its impossible to stay focussed when you are overwhelmed. 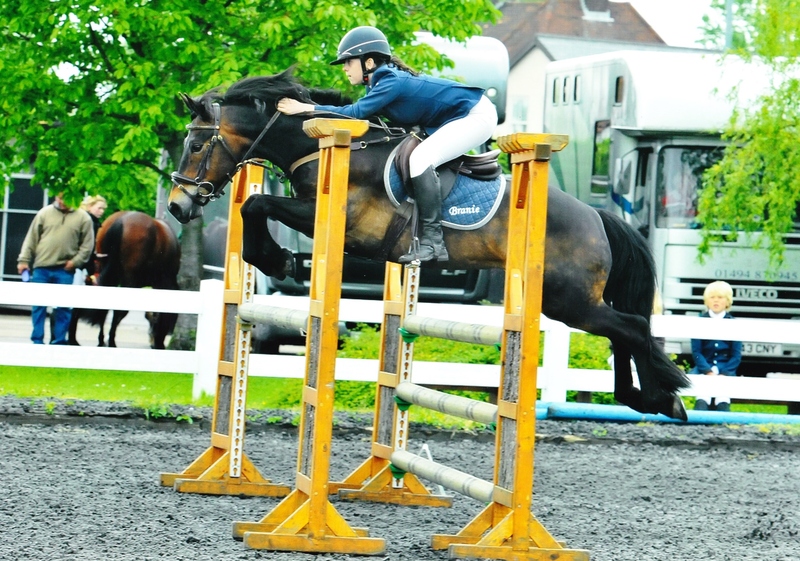 Don’t go on a fast hack if you don’t feel confident, and don’t enter the 90cm jumping if you only feel safe at 80cm! Draw on other area’s of your life where you find it easy to go into a flow state and become focussed. Maybe when you are driving, running or cooking. How could you transfer this skill to your riding. What are the qualities? It requires effort! Just by simply devoting more commitment to your focus, it will improve. Once you become more aware, it becomes quite addictive. It is a feeling of being only in the present moment, which in itself is very restful and rewarding. (Horses are only ever in the present moment). Hannah has known about the awareness number exercise for a long time, but the breakthrough came when she realised that whilst she thought she had been on a high number, she was actually on a four/five, and her focus was low. When she committed herself to getting to an eight out of ten for awareness before going into the ring, she discovered a new level of success and enjoyment, and the results followed. I was very proud of her, because even if you have someone on the ground coaching you (and in this case she has to put up with her mum)……. it is only you who can make the changes, no one can do it for you. Hannah focused on her breathing in the collecting ring, and then maintained her awareness by bearing down with her core strength into every fence, and focusing her eyes through Branie’s ears at the top pole of each jump, and it worked! Hannah and Branie at the last fence on the course. 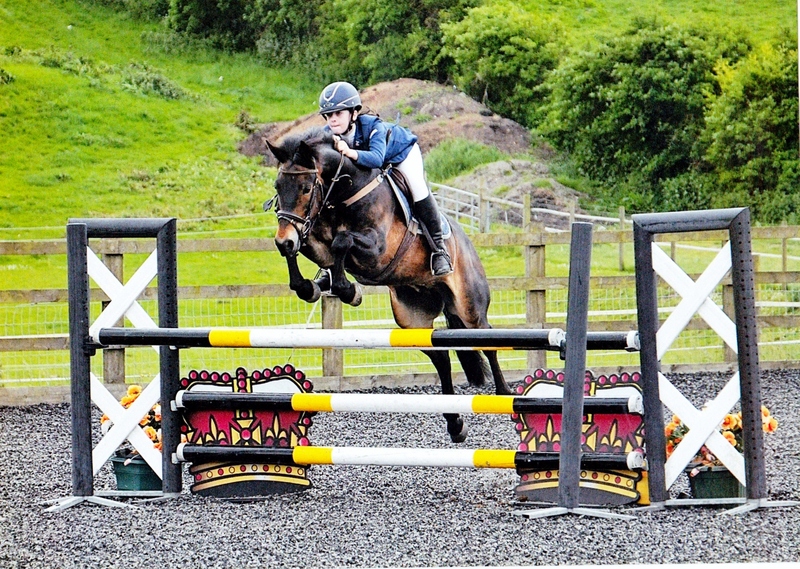 I love the matching pony and rider focus. This entry was posted in Ride with Your Mind Coaching and tagged awareness, confidence, flow state, focus, mental rehearsal, safe riding, winning. Bookmark the permalink.